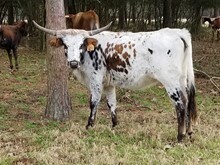 Sold at the Eddie Woods Sale in 2018 - Here is a heifer out of Smoky Roan what else could you hope for. We line bred one of the best McGill cows to one of Hunts Command Respects best Sons. Keep track of this gal. Her horns areally just starting to roll out. She will end up with the handle bar twist horns. Heifer calf at side sired by Tuff and Ready.